The daughter of a prominent figure in the history of Hull’s hospitals returned to the city today for a trip down Memory Lane. Jan Bennett is the daughter of Henrietta Brocklehurst, a pharmacist, founder of Hull’s Brocklehurst Chemist chain, and former Chairman of the Hull (A) Group Hospitals Management Committee for some 16 years, from 1958 to 1974. Mrs Brocklehurst oversaw a number of key developments during her time in her hospital role, including the demolition of the old Western General Hospital and the opening of the Hull Royal Infirmary Tower Block some 50 years ago by Her Majesty, the Queen. Prompted by Hull’s spell in the limelight as UK City of Culture 2017, Jan and her husband Peter, who now live in Bath, journeyed to Hull Royal Infirmary to do some fact-finding on her late mother as well as her father, E A Brocklehurst, another pharmacist and former Sheriff of Hull. Jan, a retired GP, and Peter, a former General Physician, visited Hull Royal Infirmary earlier today where they met with Trust Chief Executive, Chris Long, for a quick chat about their family ties to the hospital. The pair then met with Mike Pearson, who looks after the Trust Archive, and they spent some time looking through memorabilia, old film reel, newspaper cuttings and photos featuring Mrs Brocklehurst. 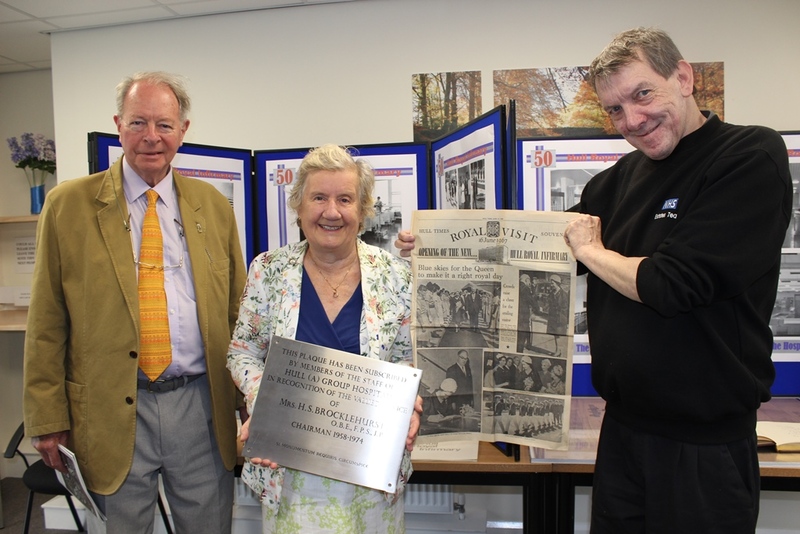 Mike had also arranged for them to see first-hand a special plaque which had been made and dedicated to Jan’s late mother, before they continued on to visit the Trust’s Brocklehurst Building. “I have early memories of Hull as a youngster and of spending time in the air raid shelter. “When the Hull Royal Infirmary Tower Block was opened by the Queen, I was a house officer training in Aberdeen, but my older sister and I came back to Hull to be with mum and to attend the opening. “I remember we were lucky enough to be introduced to the Queen; she acknowledged us and we shook hands, and I still have the glove we shook hands with now. “Mum was a fiery character and all those years ago, she would often be found on the golf course, looking for consultants who should have been at work, demanding they get back to Outpatients! “It’s great that the hospital still has all these items, but it’s a shame that people like mum; people who helped to build the city in essence; have almost been forgotten. Whilst in Hull, Jan and Peter have also visited Hull History Centre and plan to do some exploring in the city centre.